Thanos has lost that loving feeling! 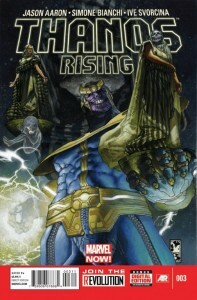 In Thanos Rising #3 our villain struggles with the pain of lost love and the inability to find fulfillment. In the end unable to fill this hole floating through the galaxy, he returns to his origins and a further step into darkness. 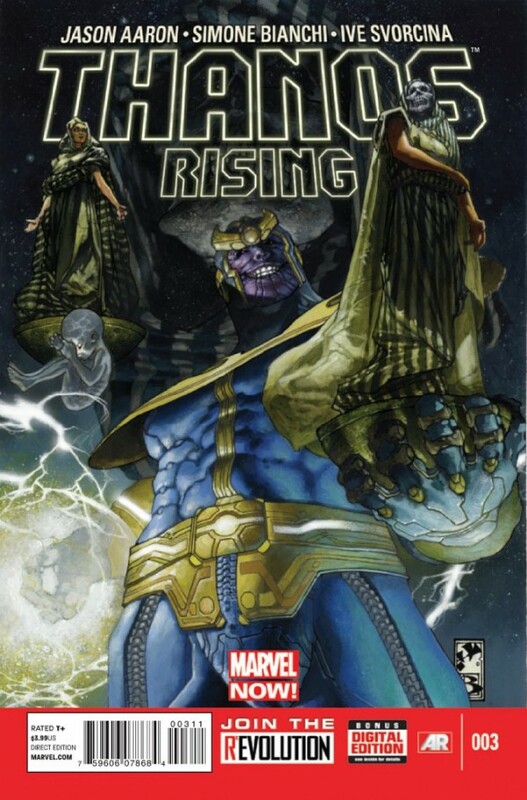 Readers of Thanos Rising #3 will be shocked with the situation Thanos finds himself in at the beginning of this tale He is a family man! Thanos has abandoned Titan and taken steps to see the greater cosmos in the outer rim. He marries and settles down as a father. But unsatisfied, Thanos decides to abandon his family and become a pirate. But he chaffs against his captain due to Thanos unwillingness to kill! The Mad Titan slips between two lives trying to forget his lost love. He continually marries new alien women and leaves them after they give birth to boy children while he continues to serve on the pirate crew. After events come to head with his pirate captain, Thanos looks to his past in his journey to find fulfillment. But of course what is asked of him to finally feel whole is horrifying. Let us be honest. This series is not for Junior Agents. The pirate storyline may feel like swashbuckling adventure, but it leads to some bad places. And Thanos’ final acts in this story are horrible, unthinkable, and terrible. The pirate Thanos showed signs of the young boy we may have rooted for in the first issue, but by its conclusion the evil is back. If you have a weak stomach, avoid this book. The serial murderer of issue #2 is back and I am convinced the nice boy is never returning. The reason Thanos cannot find fulfillment is he simply does not care. Love and death no longer have meaning to him. And unable to feel, he chooses not to kill or love the many wives he acquires. So even his inability to kill is not because he has regained his moral compass, but is simply a side effect of his lack of purpose. He is lost and finds no joy in killing. The tale of Thanos is truly tragic, and the evil his mother saw at his birth is fully evident in this story. Thanos is evil! And at times it can be tough to watch how horrible he has become. And at the same time the reader cannot stop looking at the car wreck his life is shaping into.